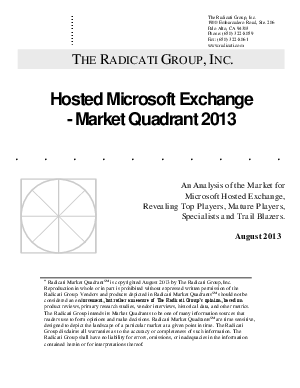 The Radicati Group, a technology market research firm, highlights its choices for Hosted Microsoft Exchange providers based on market share and functionality. They detail the criteria for a Top Performer in this market and include SilverSky in that category. SilverSky offers cloud-based email and Email Protection services, which run on IBM SoftLayer, ensuring world-class security and availability.